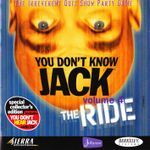 The 4th version of You Don't Know Jack is subtitled "The Ride" and departs a bit from some of the norms of the series, however it doesn't stray too far from its original winning formula. The biggest change is that the questions are now grouped into different themes or episodes. At the beginning of each game, the player is asked to choose between two different choices and their selection decides which episode to play. Each episode has questions with a similar theme and they are tracked so you do not play the same one twice. Each episode is presented like a floor of a building and each subsequent episode played gets you closer to the bottom. Another change is that the players do not select question categories. Instead, there is a money value which keeps rotating and the player presses their buzzer button to attempt to stop it on a high-valued amount. The game alternates hosts from all of the previous games for some variety. It also adds a new question type, Roadkill, which tasks players to connect a word to two other words on the screen.